Gov. Raimondo believes Rhode Island should legalize marijuana since surrounding states either have or are looking to do so. 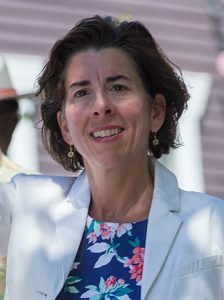 Raimondo, whose proposal will be included in her budget plan for the fiscal year beginning July 1, wants to create “the strongest regulatory framework in the country.” Unlike most other states that have enacted recreational use legalization, Raimondo wants Rhode Island to prohibit personal cultivation of cannabis plants. The governor also wants to ban high potency forms of marijuana products, such as shatter and edibles that contain more than 5 milligrams of tetrahydrocannabinol (THC). Raimondo’s proposal calls for spending about $3.5 million to launch the state’s recreational marijuana market. It calls for a sales tax of about 17 percent. Combined with taxes imposed on marijuana producers, Rhode Island anticipates $14.3 in gross revenue by the end of fiscal year 2020. It remains to be seen if lawmakers and state officials agree with the governor’s proposal to legalize adult use marijuana. In a statement on Sunday, Rhode Island House Speaker Nicholas Mattiello said he has “mixed feelings” about the proposal, and raised concerns about the impact on public health. Rhode Island Attorney General Peter Neronha also reacted to the governor’s proposal, saying it would require strong regulations. For years, bills to legalize recreational use have stalled in the State House. If Rhode Island lawmakers approve Raimondo’s proposal, the first recreational marijuana retail stores could open by next January, according to the The Journal. Rhode Island is one of the states we thought had the best chances of legalizing marijuana in 2019. You can keep up with the nation’s growing legal cannabis industry by regularly visiting our news page, and following us on Facebook and Twitter. Learn where cannabis is legal as of today through our education page.